On Friday evening, I was lucky enough to attend the Bhmbloogermeet, which was hosted by Abbigale Warner from Stealstylist.com at the Body Shop on Birmingham’s New Street. 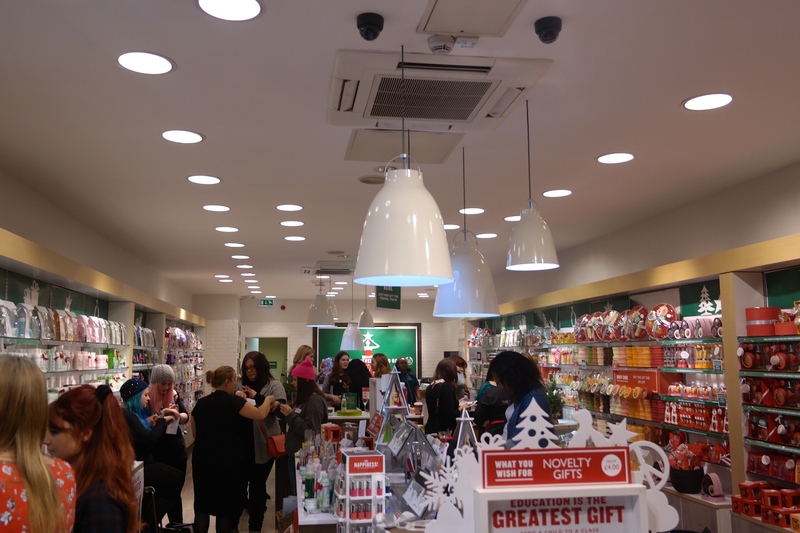 First off can I just say what a fantastic night I had, there were games, demo’s and plenty of time to get to know the other fabulous bloggers in attendance and also to a bit, okay a lot, of shopping! We were introduced to the Body Shop’s core Christmas range, Glazed Apple, Frosted Cranberry and Vanilla Brûlée. Boy, oh boy, these all smelt delicious and so edible (wouldn’t recommend testing this out though!). I think my favourite has to be the Glazed Apple, which was a bit of a shock to me as I didn’t think I would like it but O.M.G! Along with the Christmas products, we were given a talk on the hand care products they offer from the Hemp range to their Wild Rose products. I used to use the Hemp Hand Cream all the time back in the day and is perfect for really dry skin, and I am told a lot of men use this, especially manual labourers! Skincare is something I already use from the body shop, mainly their Camomile Oil Cleaner and their Vitamin E eye cream, but after being shown their Warming Mineral Mask I was hooked, so keep an eye out for a full review soon! Beauty is something I’ve not ever purchased from the Body Shop, and the beautiful Laura from Laura loves volunteered to be a model for 5 minutes for a quick eye makeup demonstration with some lovely golds being applied from their shimmer cube palette along with a contouring demonstration. I did walk away with their very popular Honey Bronzer in Shade 3. I managed to get quite a bit of Christmas shopping in and came home with three bags full! I am absolutely positive that some of my purchases will appear in my December favourites at the end of next month! I will do reviews on all the ranges/products throughout the month of December so check back to see what I think! A big thank you to The Body Shop, Propercorn (love their Coconut and Vanilla popcorn!) and Millies Cookies for sponsoring the event and of course to Abbigayle for organising and to all the other bloggers (special mentions go to Laura, Sarah, Emily, Amy, Rebecca and Sophie ) for making it such a fun evening! 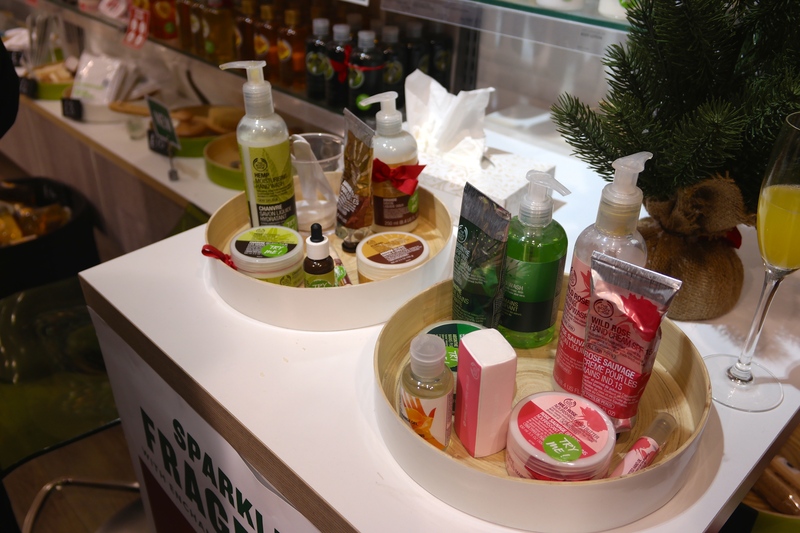 Have you tried any of the Christmas Range from the body shop yet? p.s. the middle photo above is a 50% promotion, so if you take the above pic to any body shop store you can get 50% until Wednesday 3rd December!!! ah love this post hun! Thank you for coming i’m glad you enjoyed it! !